Nelson Rolihlahla Mandela died at 8:50 pm on Thursday, December 5, 2013. He had been ill with pneumonia and died at the grand age of 95. The man was an icon in South Africa. He was born in the village of Mvezo in Transkei, South Africa. It was on the border of the Indian Ocean. His mother was Nosekeni Fanny, the 3rd of 4 wives of the chief and counselor to 2 successive Xhosa kings. As a lawyer, he became South Africa's first black president. His big thing had been fighting apartheid in this country which had been settled by Africaners who were descendants of 17th century Dutch and French settlers. He had been held in prison for 27 years, first as a terrorist, then just an agitator. At age 75, he became president of South Africa on May 10, 1994. The preceding president had been F.W. de Klerk, the last apartheid-era president. Mandela had said on July 11, 1996 that "racism is a blight on the human conscience. The idea that any people can be inferior to another, to the point where those who consider themselves superior define and treat the rest as subhuman, denies the humanity even of those who elevate themselves to the status of gods." Of course he was referring to his own experience in South Africa between apartheid facts between the many blacks and the few whites of a country where whites had ruled. When I read that I think of the Nazi attitude towards Jews. Nazis thought they were the superior race and that Jews were sub-human. Today Iran has taken on the same idea, calling Jews all sorts of animals; apes, or even viruses. Arab countries have taken on the goal of finishing the Nazi goal of wiping out Jews and now Israel, the Jewish state. 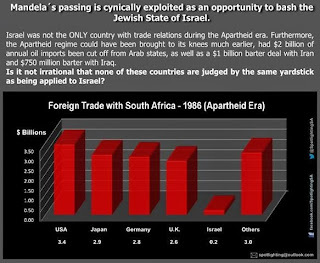 Mandela carried his own relationship with Apartheid to Israel, where he blamed Jews for practicing apartheid on the Palestinians. For this he fails my class with a resounding F. The situation was completely different. Here we have Jews, who have been treated as he and his people have been by the whole world for a reasoning of religious difference. Jews were a minority religious group, and many did look a little different from the country they happened to reside in. Often they even dressed a little different. One of their differences discovered is that they were a little smarter than others. They believed in education. The average IQ of a population is 100. Theirs is 106. They have produced such people as Einstein with an IQ of 180. They have been turned down from entering medical schools because they were flooding the schools who had limitations on Jews accepted. So even though they met the qualifications, they were Jews and were turned away after a few were accepted. Jews were treated as 2nd class citizens in the Middle East after the fall of Jerusalem in 70 CE. They were called dhimmis. So there was apartheid there. They were denied the education they craved, but had to pay more in taxes, couldn't build higher homes than their Muslim 1st class citizens. There were all sorts of reminders that they were beneath others in their eyes. In Italy, they were locked up at night in the first ghettos. It might have been their only protection from marauding citizens of Rome, but it was humiliation to be living in such a confined manner under conditions unlike others.. The same thing happened in Christian countries. Often they were reminded of a false fact generally accepted that they were the ones who had killed Christ, so they were treated as the bottom of the barrel people. The Nazis treated them as a sub-race of people while contrary to this they were the ones who were successful in business. How could they then be a sub race? The amazing thing is that out of jealousy, people believed the accusations thrown at them. They were kikes, a derogatory word. The worst show of racism was the Nazi near successful attempt at eradicating the world of Jews. We were of the inferior race, so they said. Our leadership knew that life of 2,000 years of living under such racism could not go on. So many of them had been suffering from Pogroms where the citizens of a city would gather together and attack a Jewish village, killing, marauding, destroying everything in sight, usually with the assistance of alcohol. They gathered together at the end of WWI and talked to Britain about being able to return to their ancient homeland which had been barren since they had left 2,000 years ago. They could have seriously considered some jungle spot in Africa, but had been praying in their religion to return home, so home it was for them. Why not? Nobody really had taken it as a country. It had gone to pot, as the Americans would have said. After many years of meetings, it was decided through the League of Nations and voted upon democratically. The deal was signed by the nations. They would have a Jewish Homeland. Out of guilt for having treated these people so vile, out of growth in their own religious teachings, it was decided that this was the right thing to do. The plan of the Jewish leaders was to make the land a Utopia, fair for all the inhabitants, even the animals and plants as well as people. It was planned out by an intelligent group directed by their religious principals. It was even blessed by Abdullah, head Arab leader of the Middle East since he had also been the leader of Arabs who fought for Britain against the Ottoman Empire. The Jews had done this also, but in a smaller group, being they were a smaller population. One of the Jewish leaders was Chaim Weizmann who had invented a chemical which helped Britain have better ammunition of which without this, would most likely have lost the war. It was like going from a slingshot to the Uzi machine gun. So Britain made the mistake of making the same promise of land to both the Jews and the Arabs. Enter the picture, Arabs from the neighboring lands who heard that Jews had returned to their land and were building. They realized that they could get jobs there, and the word went out. They came as workers. Now the Grand Mufti of Jerusalem, another Arab leader, was all against the creation of a Jewish Homeland and he agitated his followers who rioted and screamed against the idea, shaking up the British who didn't want to rock the boat and lose out their holdings of land with oil. So they wound up siding with them. Oil and money did rule over being nice to Jews, something they were not used to, as they had been cast out of England several times, and there existed lots of anti-Semitism with the English. Thus, the idea of being a Utopia was fought against by the Arabs in blind rage. They were from a paternal society that ruled, and that meant that they were easy followers and took direction very well without thinking things out for themselves. Most were way undereducated and illiterate at that. So they were dependent on their leadership. The idea did not come to them to really want their own state until after the 1967 war with Israel of which all Arab nations attacked and lost. It was embarrassing for them. They lost face. Anger only festered. At the same time, they were walking bombshells against Israel and Jews. Though the war was over, danger was everywhere for the Jews. Now, for the past 65 years, there is no peace treaty signed except with Egypt and Jordan, the 2 closest neighbors. The PLO's have gone through a change of calling themselves Fatah, and a group broke off from them to call themselves Hamas. Hamas kicked out Fatah from Gaza and have been shooting at Southern Israel ever since 2001. Fatah took over Judea and Samaria, the 2 oldest Jewish centers in Eretz Israel. To this day, Apartheid has not been practiced against the Arabs who maintain their hatred and fight against Israel at every opportunity and then some. Their weapons are not only real ones, but they also use lies and create terrible propaganda that such people as Mandela has bought. Because now for the first time they are people without a nation, they are looked upon as the blacks of Africa being ruled by the whites, or Israelis. Nothing could be further from the truth. Mandela reacted violently when Israel won in 1967 against its huge enemy. He hadn't bothered to read about this history so he was against Israel's control of the territories it was "occupying" and urged Israel to concede land to the Palestinians and Syrians, just like they had done with Egypt for the sake of peace. The difference is that Egypt reacted wanting peace and the others didn't, but he ignored or refused to learn this fact. His view was still the simple-Israel is occupying Arab lands and wanted them to withdraw from all the areas. This chart from the Jewish Virtual Library shows why Egypt and Jordan decided to make peace with their neighbor. In 1948 Israel started with 650,000 . By 1968 it had a population of 2,841,100. So losing almost 800 soldiers was a lot for this little country. Today it has grown to 6 million Jews and 1.7 million Arabs. Remember, it was the Arabs who had attacked Israel. They could not imagine such a great force losing against former dhimmis. Mandela finally visited Israel for 2 days when he was 81 in 1999. He had held it against Israel that they had worked closely with the South African apartheid regime. He didn't realize that for some time South Africa was one of the few countries for their own reasons who were friendly with Israel. It wasn't like Israel had a lot of choices, so they had a military relationship with South Africa. Mandela won a Nobel peace prize for his attitude in South Africa of burying his bitterness against the whites and working for the future with them. When he became president in 1994 he worked against apartheid crimes against its victims and families in earnest. When Mandela went to work as a lawyer, his first job was with a Jewish law firm in Johannesburg. Some of his best friends were Jews as a result. When he needed advice or money, he went to them. Many Jews in South Africa supported him. Arthur Goldreich gave him refuge on his farm in Rilvonia. However, Mandela passionately supported the PLO which he took as a liberation movement like his own ANC. He had mixed emotions, also supporting Israel right to exist as a democratic Jewish state. He just didn't understand what the Jews were under in order to continue existing. If he had bothered to read the platforms of Israel's Arab enemies, he would have seen that their goal was to completely destroy Israel and carry out the goal of the Nazis, to kill off all the Jews along with their state. The Sabeel movement, founded through Nelson Mandela and Archbishop Desmond Tutu, both of South Africa, is still throwing "apartheid" accusations at Israel. It's a Christian organization in Jerusalem founded by a Palestinian Anglican priest who are partners with the Presbyterian Church and are enforcing BDS practice against Israel. The Methodists are also into BDS movements and finally voted in 2012 against divestment from the Caterpillar company for doing business with Israel. This is so unrealistic as all its history shows that Israel is the most un-apartheid state in the whole world. Arabs have all the rights that Jews have in Israel. They are not dhimmis as Jews were in Muslim countries. The only thing they are not included in is having to serve in the armed forces if they don't care to. They are relived of this responsibility because it would be asking them to fight against fellow Arabs of their own religion, and Israel is being overly aware of this. In the USA, Italians had to fight in the army, and so did Germans. Japanese fought as well for the USA. But the USA is a huge country and Israel is one of the tiniest, the size of the smallest of USA states. To them it would be like expecting Iranian Jews to fight against Israel. 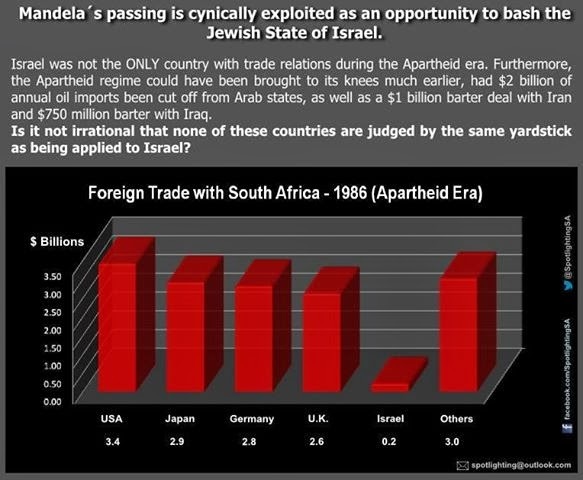 To sum it up, Mandela had an ambivalent relationship with Israel. It could have been improved upon with more curiosity as to the history of Israel and how it differed from South Africa. Even finally visiting for all of 2 days hadn't warranted further research evidently. For that I'm disappointed. He never once told the Palestinians to make peace with Israel or to take on a different attitude. He maintained a 2-state solution but told Israel not to be a bi-national apartheid state when they weren't practicing apartheid in their own one state of Israel and an Arab minority. He thought there was danger in Israel becoming an international pariah like apartheid South Africa had been. That showed he knew nothing at all about Jews, Judaism or Israel. It doesn't make a lot of difference in the world if one person harbors such feelings of anti-Semitism, but when a leader does, it's almost impossible to re-educate people. Mandela made a huge impression on USA's President Barack Obama who said that "he was one of the countless millions who drew inspiration from Nelson Mandela's life. My very first political action, the first thing I ever did that involved an issue or a policy or politics, was a protest against apartheid. I studied his words and his writings. The day that he was released from prison gave me a sense of what human beings can do when they're guided by their hopes and not by their fear." In October 1999, during his 2 day visit in Israel when he also visited Iran, Syria, Jordan, and the "Palestinian territories", Mandela showed that he was naive and overly trusting everyone but Jews evidently because after visiting Iran, had felt that the Iranians would be free and fair about the trial of 13 Iranian Jews who had been arrested in July 2001 earlier that year on charges of spying for the "Zionist regime" It wasn't until February 19, 2003 that the trial was over with 5 of them released. Iran was backed by terrorist groups targeting Jews and the Jewish state and was not about planning on giving Jews a fair hearing. This came up when Mandela spoke with Foreign Minister of Israel, David Levy at the Foreign Ministry. He thought that being the new president was Khatami and had become more moderate. Khatami was president from 1997 to 2005. Yes, but make sure they are being guided by a compass made up of good, not of evil intentions, please. Now my question is that Obama did not deal with apartheid in the USA. That had been a problem basically of President John Fitzgerald Kennedy in the 60's. One of the first things Obama did after being sworn in as president on January 20, 2009 was go to Egypt and make a speech on June 4, 2009 at Cairo University which aroused the Arab Spring. My paranoia leads me to conclude he is referring to the Palestinian Israel issue of a 2 state solution, and if he is following Mandela, is blaming Israel as being an apartheid state. Obama has been pushing that Israel must go back to the 67 lines. After all, Mandela did. Traders with South Africa before Mandala during Apartheid of 1986, shown in $billions of dollars worth.